Although there are many websites that are out today, some of them are poorly organized or designed that only repels users from looking at the content. A well designed and organized website is the best website to visit to and the simpler and cleaner it is, the better it is for any website. There are some companies or businesses that prefer to have their website designed by developers so that the design is exclusively theirs but most are being practical by purchasing ready to use themes where it can make them customize the look of it without thinking about the complications of the development side of the theme. Most developers use CMS to develop website themes, also called Content Management System. Using CMS for websites cuts off the common processes for making the website look like it but at the same time developers can add more by adding widgets for more features, function, etc. WordPress is one of the most popular CMS today and although it is mainly for blogging purposes only, today it can be used to develop in any type of purpose whether it is for personal use, showcasing products and services or an introduction of the a certain company an even starting up your online business with ecommerce feature. Multipurpose WordPress theme is preferable because any user can make use of it in any purpose they want. There are many benefits that you can get if you choose Bueza WordPress theme as your theme for your WordPress based website. 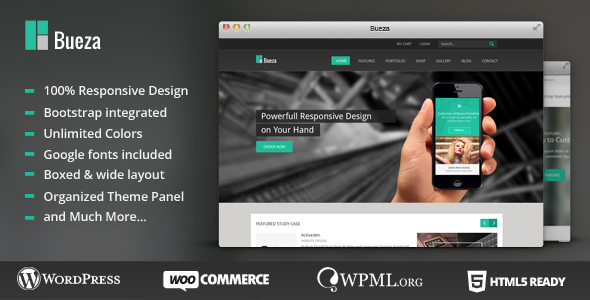 • Bueza is another simple, clean and modern WordPress theme created for various purposes. • If your purpose is to introduce your company to the world, you can use this theme according to the way you like it. There are options available at the backend panel that will enable you to choose which style is suited for your website. This can also be used for personal purposes such as blogging, the most common use for WordPress since it was first introduced to the world. 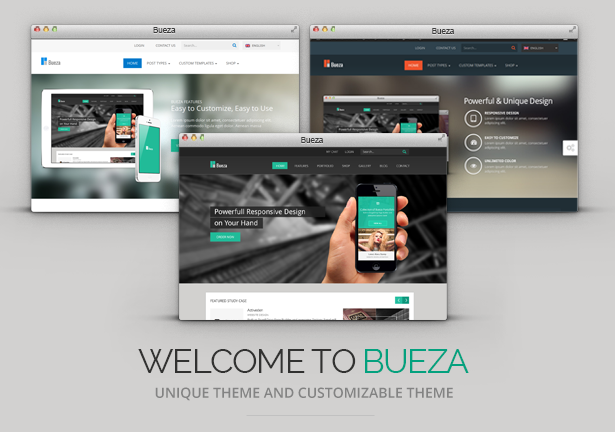 • Bueza theme comes with different four color variations. Even if you change the default color of your website, it will still retain its style and design. It also has unlimited colors option within the theme. • The theme also comes with advance admin panel which also enables administrators to customize everything they please such as different styles, layouts, plugins and easy to customize everything as well. Another features available within the theme are additional plugins such Slider revolution, WooCommerce and Ubermenu megamenu for a more complete menu on the ecommerce page. • Other features that defines the multipurpose theme are supports HTML 5 structure, CSS 3, jQuery UI, and many more. Like many established WordPress themes for download, this also comes with extensive documentation in order to guide users on how to customize the theme.